Have you ever wondered why, despite the meteoric pace of technology, we are still reading the same exact way we did thousands of years ago? Different cultures do it slightly different ways but the general idea is the same; start on one side of the page, work your way across, then move to the next string of text, rinse and repeat. 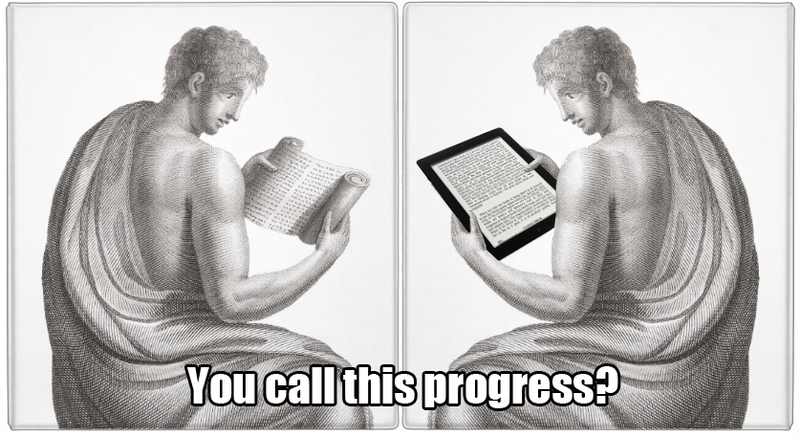 E-readers and tablets have revolutionized data storage and portability, but they do not help us read more efficiently. The most fundamental of all communications technologies hasn’t changed a bit – until now. Enter Spritz, the new technology that claims it can turbo change your reading speed to “super-human” levels. If you could read the content in the box above, you were just reading at 400 words per minute (WPM). Compare that to your average WPM by taking this speed reading test (I’ll save you the time – you are way slower). 1. Moving across the plane, from word-to-word, line-to-line, page-to-page, etc…. By rapidly relaying one word at a time, Spritz solves the first problem. The latter is solved by pre-aligning the “optimal recognition point” to a fixed point on the screen (the red letter). Spritz estimates that with traditional reading 80% of your time is spent seeking and not actually reading. They claim that their technology drastically improves (if not eliminates) the seeking : reading ratio and I think the “proof is in the pot”, in their favor. Spritz sure knows what it means to “Do Something Big”. This has profound implications beyond reading, beyond the human eye and beyond even technology: it redefines human potential. What other technologies could be created and what human “super-powers” what might they unlock? What are the limits of the human brain and body? Are there limits? A popular theme in science fiction is the notion that future technologies will allow humans to train and access profound physical and mental capabilities that would otherwise lay dormant; unlocking "super-powers", so to speak. Frank Herbert was a luminary of this concept (among others) in his sci-fi masterpiece Dune, in which humans can train their brains to store and recall information like Wikipedia or can tune their nervous system to be ultra-aware and responsive. A more widely known example of this theme is the notion of “The Force” in Star Wars; Jedi’s are shown using a variety of high-tech training tools to invoke powers that are internal, natural, and non-technological at their core. Note that this concept is distinctly different from the similar theme of cybernetic enhancements in science fiction. With cyborgs, implanted technology is supplementing human ability, whereas what I’m addressing in this blog is the concept of external, non-invasive technologies cultivating natural human talent - to a fantastic degree. Science fiction writers have been correct on many of their predictions in the past, so why should this be an exception? What "super-powers" might we all already have? That is all for now, I hope you liked my ramblings! Here is one more bit of technology that leverages vision and visual processing to make a better you! f.lux: Did you know that the light from your computer monitor tricks your eyes (and brain) into thinking it is daylight, hence daytime when you are looking at it? This can throw off your body’s natural sleep cycle and make it difficult to go to, and stay asleep, for some people, particularly those working on computers late at night (like me). When the sun goes down, f.lux re-calibrates your monitor to emit a color of light that is more similar to indoor light. This allows your body to be more in sync with natural day-night cycles and promotes a better night's sleep. The first couple times you use it, your monitor might appear a bit more reddish, but after a couple days, you won’t even notice. I was skeptical at first, but now I love f.lux and that seems to be the case with most users.